Those attending Apple's annual Worldwide Developers Conference in San Francisco next week will have the aid of a new iPhone application designed to help them find sessions and get directions. As first noted by MacStories, the application allows users to the schedule of sessions for the conference, which will run June 7-11 at San Francisco's Moscone West. It features a searchable list of sessions, sorted by date. Users can view events currently happening, or browse what is available later. The software, which can be downloaded at developer.apple.com/wwdc/app, is only available for those attending the conference. Attendees can access it by logging in with the account used to purchase their WWDC ticket. The application also features a list of favorites that attendees can populate, and also provides updates on what's happening. 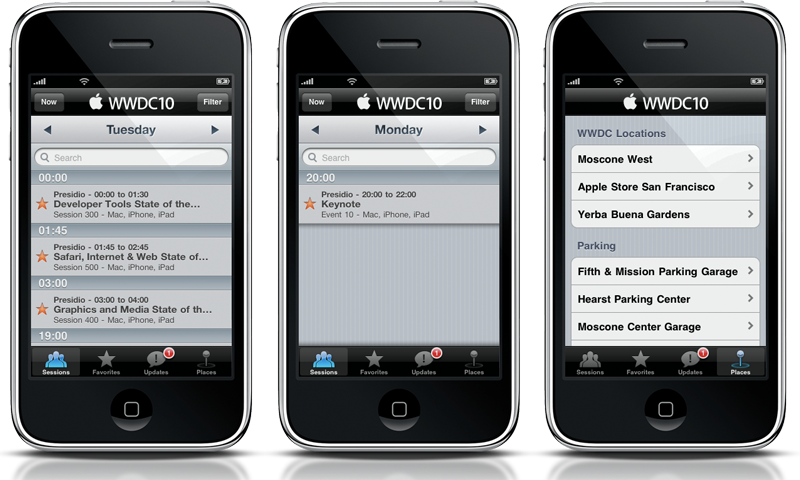 Apple's official WWDC 2010 application also features a "Places" tab, that gives a list of helpful locations for those in the San Francisco area, including the location of Moscone West and the nearest Apple Store. Users can also find nearby parking through the software. This year's WWDC sold out in just 8 days, even with higher ticket prices, increased from $1,295 to $1,599. It is believed that this year's event will focus on iPhone OS 4, and will not feature an advanced preview of the next version of Mac OS X 10.7. The conference will kick off on Monday, when Apple co-founder Steve Jobs will give the opening keynote for WWDC. Jobs is widely expected to unveil new products, particularly the next-generation iPhone. New rumors on Saturday suggested he could also introduce Safari 5 with a new Reader feature and support for Bing search, as well as Mac OS X 10.6.4.